DEFCY.COM | Defence Privacy on the @net. VPN Providers guard over information security. The access to your favorite sites and social network services is denied? 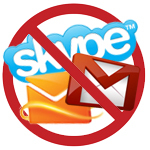 You are forbidden to use ICQ or SKYPE messengers and free e-mail services? Don’t panic! We can give you the opportunity to bypass office restrictions on access to myspace.com, twitter.com, facebook.com, gmail.com, youtoube.com and many other popular internet resources. We will help you to outwit curious system administrators and let you know how to bypass all the system “traps” and save in a secret your network information. The proxy service gives the unique opportunity for those who craves to visit his favorite sites sitting at his workplace during working time. Anonymizer is a software package with an open VPN technology with proxy server functionality which helps to bypass different system restrictions and secures your network. The VPN provider contains many unique interesting internet resources which are not available for free access. Operation of the proxy anonymizer is especially urgent when connecting any wireless networks or using IP-telephony – which is quite common in everyday business life. The anonymizer makes company’s traffic inaccessible to strangers and no one can detect the sites you browse and the information volume you transfer.